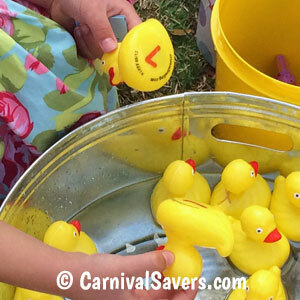 Matching Ducks - Carnival Game! Don't use Rubber Ducks - they tend to tip over. Kids have 3 chances to choose a matching pair. This game is a super easy and fast game to set up! 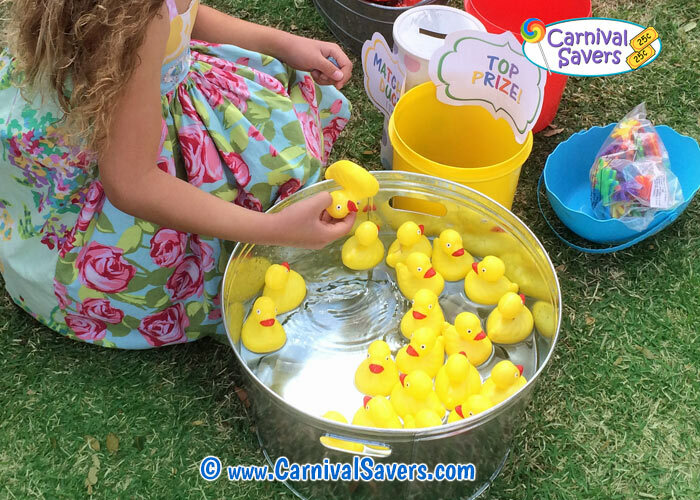 Gather your prizes, place in different baskets or buckets and set out your ticket box near your "duck pond". Next, you simply need your "duck pond" to be filled with just enough water for the ducks to float and to place the ducks in the pond. Wait to add the water until you are ready for children to play this game - this can be one of the last games you set up before kids are ready to play! Warning: Only fill with water when an adult can be present at all times to ensure that a toddler does not fall in. Please see this Consumer Product Safety Commission PDF on preventing water injuries for children. The goal of this game is to choose 2 ducks and match the numbers on the bottom of each duck to win a prize. Party players are given 3 chances to pick two different ducks with matching numbers on their bottom side. If the numbers on 2 ducks match, they win a prize! Each player has 3 chances to match the ducks. So each player may pick 2 different ducks up to 3 times to see if they can come up with a matching set! This game is especially loved by toddlers and is also a traditional carnival game! 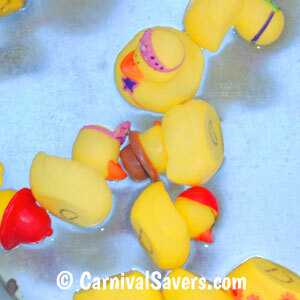 This game is harder than it looks so for your carnival themed birthday party with younger children, you may wish to allow players to have as many chances until they get a matching pair of ducks! Sometimes customers have called us wanting to use the cute rubber ducks for this booth. We have found as fun as these ducks are, they do not seem to float right side up! (see the image above.) Our favorite ducks we have found are the matching ducks. We have found they make the Duck Pond Game more fun than just choosing one duck and the game is over and they seem to be the best floaters we have found! The Duck Pond is a traditional carnival game loved by young children, but don't have your feelings hurt if the 4th grade and older children walk right by this booth - it will seem too childish for them to stay to play. Choose prizes with that in mind - things that will appeal to toddler and preschool children. We also love to have Toddler Prizes available at all booths where children under the age of three year would like to play. 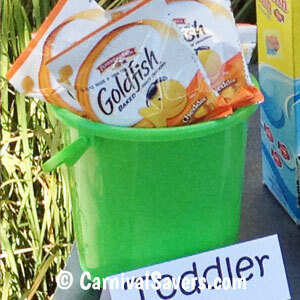 Toddler prizes can be simple like min fish crackers or toddler fruit gummy packets that are safer for younger children. Give parents the opportunity to have a Toddler prize instead of the other small toys that are not designed for children under the age of three. Warning: Because this game involves water, be sure to have an adult present with this game at all times! Also, please follow the guidelines from the Conusmer Products Safety Commission regarding young children and water. Click here to learn more. SUPPLIES & PRIZES for the MATCHING DUCKS CARNIVAL GAME!